When it's necessary to change the configuration of a SDKBOX plugin, you will need to revise the JSON codes in the sdkbox_config.json, rebuild the application, and re-submit it to app stores. To solve this issue, Remote Configuration allows for on-the-fly update of its plugin's configuration. For example, it will allow the change of the Google Analytics tracking code, switch to a new AdColony campaign or add new in-app purchase products without rebuilding and redeploying your apps to the app stores. The application will automatically pull the new configuration and put it into effect. This means that you can update configuration information on the fly and everyone playing your game will get updated the next time the user starts the application. To ensure security, during normal execution the new configuration is locally saved in the applications's private folder. Also, configurations are cyphered and its contents are not exposed, even if your application runs on a rooted/jailbroken device. Draft: multiple, they are not accessible from any applications. Each Configuration Set has a unique pair of token and secret. They are used to securely communicate between to the app and SDKBOX LiveOps. They can not be changed. They need to be set in the app. See the "Setup Remote Config in App" below for detail. 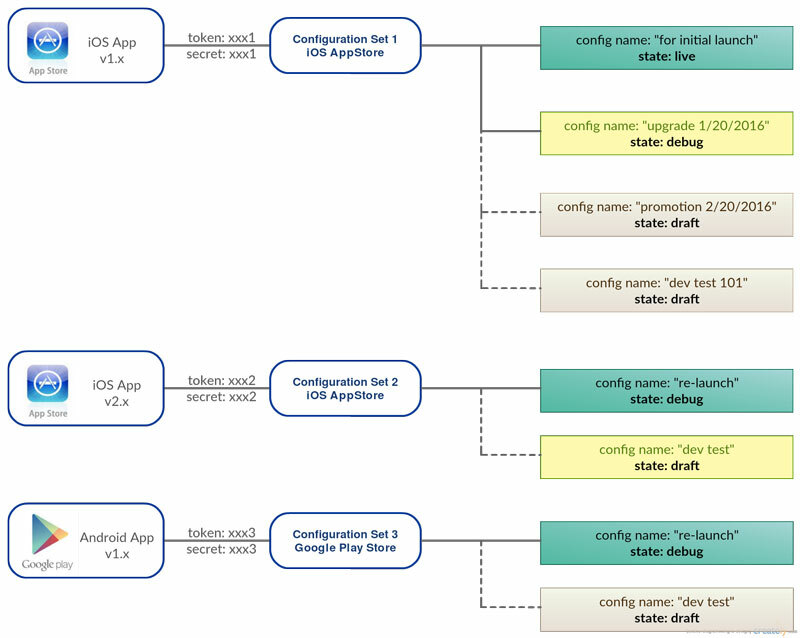 An app will use the specific token to get either the Live or Debug version of config in a set, follow the sequence diagram above. When you integrate SDKBOX plugins, a local sdkbox_config.json will be added in your app. It contains the settings of all the SDKs. For moving the local configs into the cloud, we provide a convenient feature to import them automatically. On your application's page, click on "Import Sets" button and upload your local sdkbox_config.json. All you current configurations will be loaded into a few new configuration sets, one for each app store. After importing, you should make the remote config as the master version moving forward. The local copy in your app is a local default which only used when the network is not available. The newly created configuration sets by importing are still in Draft state. They are not accessible by the client, until you can edit and publish them to the cloud. A code snippet for initializing SDKBOX with the token/secret of all platforms. You should copy and paste them to your app delegate. A new version of sdkbox_config.json that includes the latest configuration values in the cloud. Whenever an app is submitted to the app store, please update the embedded version of sdkbox_config.json in the app. In case if network connection is not available. this local config will be used by default. Once the setup is completed, you can not update the configuration in the cloud and push the changes to the live app. Make sure to set the configuration to Live or Debug in order to be downloaded by the app. Make sure to edit the correct config in the set which is marked with the same token/secret as in your app. Build Date UTC :2019-04-24 14:26:10.475651, Documentation built with MkDocs.